America's first completely bookless public library opened in San Antonio this past weekend. That is, if you define a "book" as words printed on paper pages which are bound together with glue. But if you define "book" a bit more liberally, the new library has plenty them. Over 10,000 ebook titles, in fact. All of which can be accessed from their 900 e-readers, 57 computers, 40 iPads, and four touchscreen tables. It's still too early to tell just how common the totally bookless library will become, but we're clearly one step closer to the futuristic world of paperless libraries that's been promised to Americans for decades. But is that a good thing? The library as an institution is having a bit of an identity crisis here in the early 21st century. Broadly understood by the American public as a physical space that provides a community with access to information, deadtree books used to be a natural fit for the library. For centuries, books have functioned as a wonderful piece of technology, acting as an extremely portable, reasonably durable, and wonderfully sharable device for conveying ideas. But nobody knows just how long the book will remain the dominant technology associated with libraries. 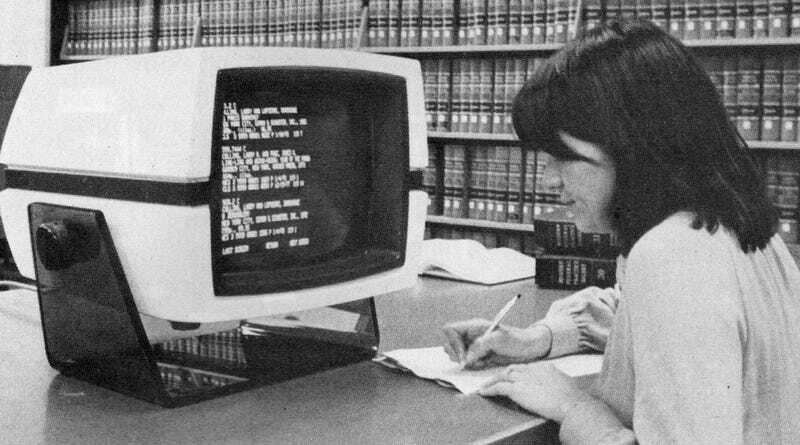 The last half century has seen countless predictions about the bookless library of tomorrow. Even the home library in the living room of tomorrow was going to see a fundamental shift. And despite the recent plateau of ebook sales, there's a sense that the library is currently undergoing a major shift in its mission. One fascinating example of people foreseeing this shift comes from an article written 35 years ago in The Futurist. The April 1978 issue of the magazine included an article by Robert Frederick Smith titled, "A Funny Thing Is Happening to the Library on its Way to the Future." With a lede that could be reused today with only minor substitutions, Smith describes the romanticized library of yesteryear (from the perspective of 1978, of course). The library used to be a large room filled with book-crammed shelves and presided over by a prim, bespectacled woman charged with enforcing the rule of SILENCE. But all that is changing rapidly thanks to the information explosion and modern technology. Smith goes on to explain that the library will evolve in the next couple of decades, causing the people using them to understand the physical space differently. During the next two decades, most libraries will evolve into "information centers." The patrons of these centers will sit at video display units resembling today's television screens. Occasionally, one will murmur with delight at finding just the right citation from a computerized data base. The librarian—or information scientist—will wander about the room giving advice on how to make best use of the data base. The kinds of databases Smith refers to are still in use today, but it's interesting that we perhaps view them as much less centralized. Already some libraries can tap huge collections of related data—typically taking the form of abstracts, citations, or even full-text records—that are stored in computer memory banks at central locations throughout the United States. Most of these data collections contain information that is specialized or technical — for example, medical or legal abstracts — but immediately valuable to certain users. Few people today talk about tapping into the internet with the same terminology that you might use to describe point-to-point communication. In the eyes of the average user, I'd argue that the internet (whether that's my local library's catalog or a Wikipedia page on turtles) is a sea of information parsed largely by robots—not stored in memory banks at central locations. Even if the latter is a somewhat more accurate description of how the internet actually works. Later in the article, Smith gets into the future demise of books, at least as applicable to the 70s. There are hints that other forms of media may even overtake both the printed and electronic word on page and screen. Print on paper is becoming less acceptable as an information storage device and less popular as an information medium. Audiotapes, videocassettes, and microforms possess definite advantages over print for certain purposes. The realization among librarians that such media are often more popular and more useful than books has led to efforts to shed the traditional image of the library as a repository of books. Thus, what once would have been called a library often is known as a "media center," and the person who would have been called the librarian becomes known as the information or media specialist. This trend may be expected to continue and intensify; already many libraries with video units and programming for loan are finding that the total viewership of their relatively few loaned videocassettes exceeds the total readership of book loans. Personally, I have a soft spot for the old-fashioned, deadtree book and the libraries that celebrate it. But the library cannot be a static institution. The library has slowly evolved to include all kinds of different media over the past half century. Providing access to information in the 21st century obviously means providing different tools than libraries did a century ago. Deadtree books simply aren't enough. But in this guy's humble opinion, they should still be part of the equation. As the local news in San Antonio notes, the new bookless library is serving a low-income community where just 25% of residents have access to the internet. With everything from bill-pay to job applications requiring an internet connection these days, they're providing an absolutely vital service. Only time will tell if the deadtree books of tomorrow will still be considered just as important. If You Could Turn Back the Clock on Tech, What Year Would You Choose?